A file will be downloaded, which contains your VPP Company Token. Open the downloaded file with a text editor and copy the content to your clipboard, you’ll need this VPP token within the Citrix XenMobile Device Manager later on. After you retrieve the VPP Company Token we need to switch over to the XenMobile Device Manager console and update the settings. Enter the VPP Token you previously retrieved through the Apple VPP Site, to connect the Citrix XenMobile Device Manager with your Volume Purchase Program. Now we are ready to deploy corporate purchased content (Apps / Books) to enrolled iOS devices. Let’s proceed and buy a example application. Switch over to the Apple Volume Purchase Program website and select a program you’ll want to purchase. Enter the required (partially) content name in the Search button, select the Media Type / Category and click search. A search list with all possible content will appear. The purchased application will automatically appear within the Citrix XenMobile Device Manager Console. Switch back to the Citrix XenMobile Device Manager console and select the Applications Tab. 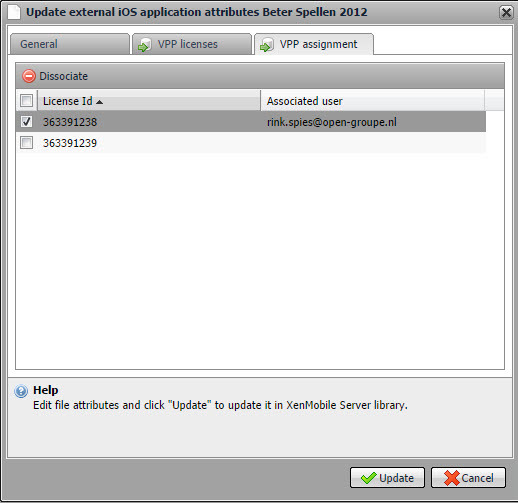 You’ll notices the previously purchased application “Beter Spellen 2012” is already available within the applications tab. Go ahead and open the application to verify the purchased licenses are visible within the application. 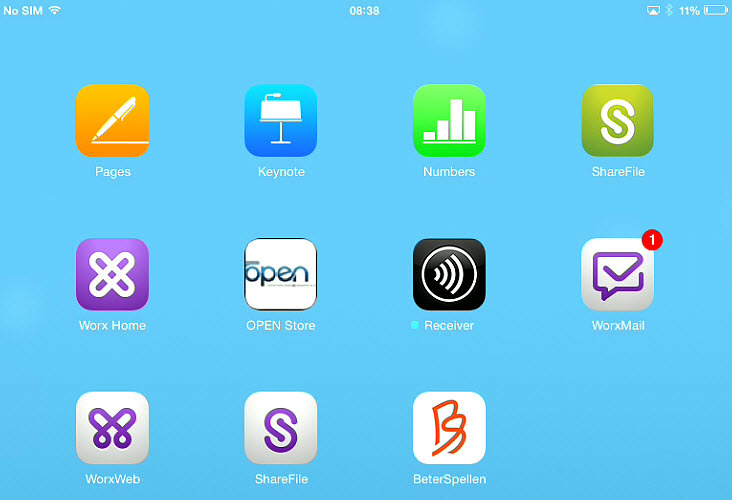 On your enrolled iOS device open the Enterprise AppStore and select the application “Beter Spellen 2012”. Citrix XenMobile Device Manager will push the installation request to your iOS device and within moments the corporate purchased application will appear on the home screen. Now the application is installed let’s take a further look at the VPP License with the Citrix XenMobile Device Manager. If you need to revoke the license select the user and click Dissociate. Confirm the Dissociation of the VPP License and watch the notification on your iOS device. With XenMobile 9.0 I’m only able to configure the Citrix XenMobile Device Manager for VPP and unfortunately not the Citrix XenMobile AppController. Hopefully the VPP integration will also be available for XenMobile App Edition customers in upcoming releases. Usually I prefer to display all applications through the WorxHome store and remove the XenMobile Device Manager Enterprise Store. To make use of the Apple Volume Purchase Programs, applications need to be delivered by the Citrix XenMobile Device Manager, so users will end up with two corporate app stores.